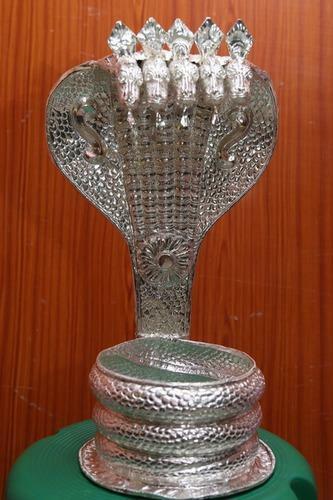 We are offering pure Silver Er Nagarbharanam done with most intricate sculpture with a finish none can match. Difficult to see such a fabulous well sculptured nagabharanam done with a passion for adorning to lord shiva to a temple. When you enquire please give the height of Banam (lingam) and the circumference of the lingam to give you a perfect estimate. Kanakkadara Divine Services is basically a client centric company which was established in 2006 at Chennai in Tamil Nadu, India. Today, it is the leading organization in the domain of the manufacturing, trading, supplying and exporting of Statue, Sculpture & Temple Construction. We offer product range of Black Stone Sculpture, Stone Sculpture & Divine Sculpture. We work hard to meet the demands of clients effectively and allow no laxity in achieving the same. The use of best grade material for entire range helps us in accomplishing the desired quality with ease. Our procurement team has built great contacts in market which helps us in getting the best grade raw material used in development of the highly adorable range. We are an organization which highly values time of our clients and thus, ensure we meet their entire demands within promised time. Kanakkadara Divine Services is committed in creating intrinsic divine value to preserve the Indian heritage and is revered for the awesome Sacred Projects for various Temples across the Globe. We export our product in all over the world.